Low-cost, regular ferry service from Ibiza Town direct to Formentera, with multiple ticket trip options for same day or open return. All year. From May till October there is also a direct service to Formentera departing 2 or 3 times a day from Figueretas and Playa d'en Bossa (see more info here). 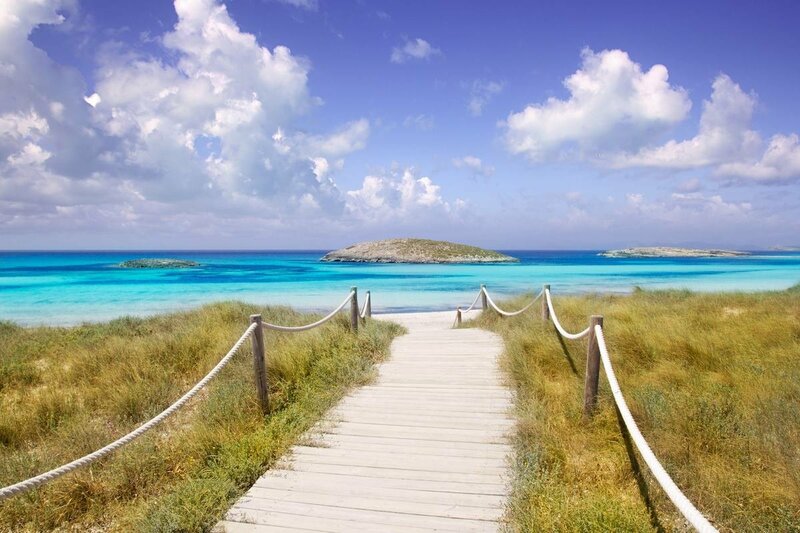 Whilst visiting Ibiza, take some time to experience the paradise of Formentera, with its famous Playa de ses Illetes, crowned the sixth best beach in the world by TripAdvisor. Aquabus offers an excellent regular service all year round with different ticket options depending on whether you want to go for the day (same day ticket) or whether you are staying in Formentera (open return ticket). Children and residents of Ibiza get a special discount and 0 - 3 year old travel free. If you are travelling with a suitcase, bicycle or pet you will be happy to know that no extra charge is applied. On board during the 40-50 min. trip, each passenger receives a map of Formentera with recommendations from the staff about how best to enjoy the island according to your budget. NOTE: This ticket is also valid for departures from Formentera to Ibiza. Recommendations: sun cream, sun hat, sun glasses, a jacket or cardigan (temperatures drop when sailing back in the evening) and if you suffer from sea sickness Biodraminas (the drug sold in Spanish pharmacies for sea and air sickness). Cancellation policy: If you cancel more than 24 hours before your date of departure as shown on your ticket, you will be fully refunded. The trip was fine. The boat is a bit slower than the others, but if traveling with a family the cost savings makes up for the extra 20-30 min in transit (each way). Did two ferry trips to Formentera from Ibiza using this service and were happy. I would give it full ratings based on price/value alone, however it loses a star since I was required to pre-determine what time my return trip was. That takes away flexibility for a change of plans and/or the risk of loosing your ticket if you miss that specific boat. Overall I would likely use them again. There are faster boats .. But it was a nice experience. On time and clean. Booked a trip to Formentera before holiday and Aquabus staff were really helpful online in selecting day of travel after we arrived on the island. The trip was great only 10 mins longer than larger ferry companies but you really experience the journey on Aquabus. 1 star away from perfect as boarding in Ibiza town was a little disorganised and no help was offered with trying to board with a child buggy. Other than that, second time we have used Aquabus and we definately use them again. Nice staff and relaxing travel. Travel cost is cheap. would have loved to experience this as it seems good but the boats were cancelled when we arrived at the port, despite other boats still running. A shame. Swapped email confirmations for proper tickets at ticket office 40mins before 10 am departure. Had great 40min sea journey to Formentera. Kind staff escorted us to scooter hire shop. Went round towards Es Pujols and stopped at Sa Roqueta beach/hotel/cafe for a fab time drove on to capital and navigated back to the port. Caught 3.30pm ferry back to Ibiza town. Great value, wonderful day out, superb all inclusive package offered by Spotlight Ibiza. Would definitely do again. Hi I loved that Spotlight booking allowed me to book open date/time tickets for any point of my stay. Other sights I checked needed specific dates and times for a return journey which I think is too hard to predict on a holiday. It was the same price as booking there on the day but to hand the tickets before hand as a surprise was lovely and another way to manage spending money.The boat is smaller than others but that is reflected in the price.If someone really needs to ensure the return crossing time ,I would say get back to the harbor to get to the front of the queue in case its full. Could be a good idea for the sight to recommend that travelers avoid a big meal before the crossing back as it's a choppy crossing and lots of us lost our lunch! Still worth the beautiful trip to a gorgeous island. combines a trip to Ibiza town too which is fabulous for shopping. Ibiza Spotlight says: "Thanks for your advise. We will take it into account." Both of our boats were cancelled absolute shambles getting there, they than booked us into the bigger boat both ways. Overall a great service. On time, comfortable and just overall a great/affordable way to get to Formenterra. Valued for the money charged. I recommend.